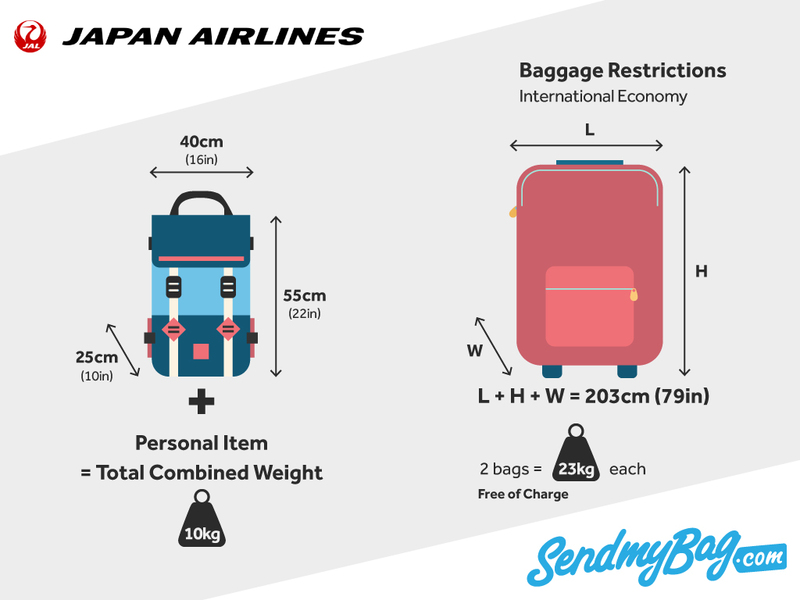 Check Japan Airlines baggage size restrictions and fees before you travel. Why not avoid the hassles of bringing checked baggage with you on your journey by instead sending your luggage to your destination with Send My Bag? This way you can avoid queuing at bag drop and luggage carousels and instead just sail through the airport with only a small handbag to carry. Sending your luggage is a great option for people who need more luggage than Japan Airline allows, such as those moving abroad or those going on an extended vacation. Click here to see how cost effective it is to send your luggage. One piece of carry-on with dimensions of 55 x 40 x 25 cm (22 x 16 x 10 in), plus one small personal item. The total weight of the two bags must not exceed 10 kg. If your bag does not adhere to Japan Airline’s baggage allowances it may be checked into the hold. Small musical instruments with total dimensions under 115 cm (or 100 cm on aircraft with fewer than 100 seats) may be carried on board as carry-on luggage. Larger instruments can be carried on board if a seat is purchased for them, and a special fee is paid. Economy and Premium Economy Class passengers may check two 23 kg (50 lbs) bags, free of charge. Business and First Class passengers can check three 32 kg (70 lbs) bags. No checked bag should measure more than 203 cm (79.9 in) in total dimensions. There is an allowance of one checked bag with the same weight and dimensions of the accompanying adult, for an infant travelling on an adult’s lap. An infant not travelling in their own seat is permitted the same baggage allowance as the accompanying adult, but each bag must not exceed 203 cm in total dimensions. A stroller or child seat can also be checked for the infant, free of charge. If you bring additional bags to those included in your free Japan Airlines baggage allowance, you will be charged 20,000 yen (200 USD) per additional piece on flights between Japan/ Asia/ India and Hawaii/ North/Central/South America/ Europe/ Middle East/ Africa. On these routes an overweight bag between 23 and 32 kg will incur a charge of 10,000 yen (100 USD) and between 32 and 45 kg, 60,000 yen (600 USD). An oversized bag costs 20,000 yen (200 USD). Prices vary on alternative routes. Looking for Japan Airlines sized hand luggage?